Holiday feast in Jamestown Settlement. WILLIAMSBURG, Va.— Jamestown Settlement and the American Revolution Museum at Yorktown offer visitors the opportunity to experience holidays of centuries past during seasonal events “Foods & Feasts of Colonial Virginia,” November 22-24, and “Christmastide in Virginia,” December 20-31. Foods & Feasts of Colonial Virginia, November 22-24 – The holiday season starts on Thanksgiving Day with a three-day event that explores foodways of 17th- and 18th-century Virginia and centuries-old cooking and preservation methods. At Jamestown Settlement, historical interpreters demonstrate how food was gathered, preserved and prepared on land and at sea by Virginia’s English colonists and Powhatan Indians. At the American Revolution Museum at Yorktown, programs examine typical soldiers’ fare during the Revolutionary War and trace the bounty of a period farm from field to kitchen. While food preparation in the museums’ outdoor living-history areas is for demonstration purposes only, the Jamestown Settlement Café will offer a traditional Thanksgiving dinner on Thanksgiving Day, Nov. 22. Christmastide in Virginia, December 20-31 – Holiday traditions of 17th- and 18th-century Virginia are recalled with special interpretive programs and period musical entertainment, along with daily appearances at Jamestown Settlement by the Lord of Misrule, “grand captain of all mischief.” Jamestown Settlement interpretive programs allow visitors to compare and contrast English Christmas customs of the period with how English colonists may have observed the season in the difficult early years of the Jamestown colony. Visitors to the American Revolution Museum at Yorktown can hear accounts of Christmas and winter in a Continental Army encampment and glimpse holiday preparations at a period farm. This holiday season and throughout the year, visitors of all ages can enjoy the museums’ immersive indoor gallery exhibits to learn about America’s past, including two ongoing special exhibitions – “TENACITY: Women in Jamestown and Early Virginia” at Jamestown Settlement and “Blast from the Past: Artillery in the War for Independence” at the American Revolution Museum at Yorktown. Outdoors, experience historical interpretation and hands-on activities in re-created outdoor settings – a Powhatan Indian village, 1607 ships and colonial fort at Jamestown Settlement, and Continental Army encampment and Revolution-era farm at the American Revolution Museum at Yorktown. These living-history museums of 17th- and 18th-century Virginia offer many ways to make the holidays memorable, from tickets and packages, some of which include other Williamsburg area attractions, to unique shopping opportunities in the museum gift shops. History is Fun – This online ticket offers unlimited admission to Jamestown Settlement and the American Revolution Museum at Yorktown for seven consecutive days and represents a 20 percent savings over individual admission. The ticket, which includes daytime special events and special exhibitions, is $25.50 for adults and $12.25 for ages 6-12, and can be packaged with Williamsburg area lodging. Children under 6 are free. Private tours for 14 or fewer people are available at each museum for an additional fee and can be reserved in advance online or by calling (757) 253-4939. America’s Historic Triangle – This ticket features unlimited admission for seven consecutive days to Jamestown Settlement, Historic Jamestowne, Colonial Williamsburg, American Revolution Museum at Yorktown and Yorktown Battlefield. The ticket is $93.50 for adults (ages 16 and older), $42.75 for children (ages 6-15), and can be packaged with lodging. Holiday events include Colonial Williamsburg’s “Grand Illumination,” December 2; Jamestown Settlement and American Revolution Museum at Yorktown’s “Foods & Feasts of Colonial Virginia,” November 22-24, and “Christmastide in Virginia,” December 20-31. Four-Site Value – This ticket features unlimited admission for seven consecutive days to Jamestown Settlement, Historic Jamestowne, American Revolution Museum at Yorktown and Yorktown Battlefield. The ticket is $39.50 for adults (ages 16 and older), $27.50 for ages 13-15, and $14.25 for ages 6-12, and can be packaged with lodging. For holiday shoppers, Jamestown Settlement and American Revolution Museum at Yorktown museum gift shops offer a selection of books, prints, museum reproductions, educational toys, games and souvenirs relating to the 17th and 18th centuries. Jamestown Settlement’s special exhibition gift shop has an assortment of items related to “TENACITY: Women in Jamestown and Early Virginia.” Admission is not required to visit the museum gift shops, open 9 a.m. to 5 p.m. daily. Shop online at shophistoryisfun.com. Jamestown Settlement and the American Revolution Museum at Yorktown, open 9 a.m. to 5 p.m. daily year-round, closed December 25 and January 1, are separated by a 25-minute drive along the Colonial Parkway, a National Scenic Byway. Jamestown Settlement is located on Route 31 just southwest of Williamsburg. The American Revolution Museum at Yorktown is located on Route 1020 in Yorktown. Parking is free. Admission to Jamestown Settlement is $17.00 for adults and $8.00 for ages 6-12 and, to the American Revolution Museum at Yorktown, $15.00 for adults and $7.50 for ages 6-12. Children under 6 are admitted free. A combination ticket to both museums is $25.50 for adults and $12.25 for ages 6-12. An American Heritage Annual Pass, $38.00 for adults and $19.00 for ages 6-12, makes a great holiday gift and offers recipients one year of unlimited admission to both museums. For more information, call (888) 593-4682 toll-free, (757) 253-4838 or visit historyisfun.org. Old Bethpage, NY – Old Bethpage Village Restoration (OBVR) will host the 176th Annual Long Island Fair this weekend: September 22 and 23. Enjoy magic shows, a petting zoo, and historical entertainment. Stilt walkers traverse the grounds, and entertainers delight families with puppets, juggling and storytelling. All of these festivities continue a 176-year tradition. Attractions such as livestock shows, the Timberworks Lumberjack Show, tractor rides, Civil War reenactments, and Rough Rider demonstrations whisk riders back to another era. Eats for sale: candied apples, pumpkins, organic veggies, fresh-made candy, giant turkey legs, and funnel cakes. Meanwhile, baseball fans can enjoy the end-of-season matches of OBVR’s Old Time Baseball League, which recreates “baseball” as it was played in the latter half of the 19th century, with teams competing in authentic uniforms and playing under the names of Long Island clubs of that era. The Long Island Fair is the New York State-recognized county fair for Queens, Nassau and Suffolk, and involves the cooperation of the Nassau County Department of Parks, Recreation and Museums and the Agricultural Society of Queens, Nassau and Suffolk Counties. Thousands of exhibits are entered every year in friendly competition, with blue ribbon categories including livestock, flowers and vegetables from farms and home gardens, culinary, needlework, hobbies, and a junior division for those 13 and younger. This year’s competitions will also include an “Advanced” category for new professionals, novices and students who are serious about their craft. Entries in this category will require a fee, with generous first, second and third place prizes; and the judges will be required to submit credentials in the specific classes. The fair is unique among New York State County Fairs in that it maintains much of the historical ambiance of the 19th century. The fair was founded in 1842 and became known as the Queens County Agricultural Fair, but soon after was called the Mineola Fair when it moved to a permanent location in Mineola in 1866. The fair moved to Roosevelt Raceway in 1953 and to the newly opened Old Bethpage Village Restoration in 1970, where it is held on a 12-acre recreation of the original Mineola Fairgrounds. The Long Island Fair hours are 10 a.m. to 5 p.m. on Saturday and Sunday. Entrance fees are: $15 for adults, $13 for children (5 to 12) and seniors 60 & up. Children 5 and under and Active Military Personnel: Free. Old Bethpage Village Restoration provides visitors with a unique and wonderful opportunity to step back in time and experience life in a recreated mid-19th Century American village set on more than 200 acres. Old Bethpage Village is located at 1303 Round Swamp Road in Old Bethpage; for more information, call (516) 572-8401. For more information about the Long Island Fair, visit www.lifair.org. 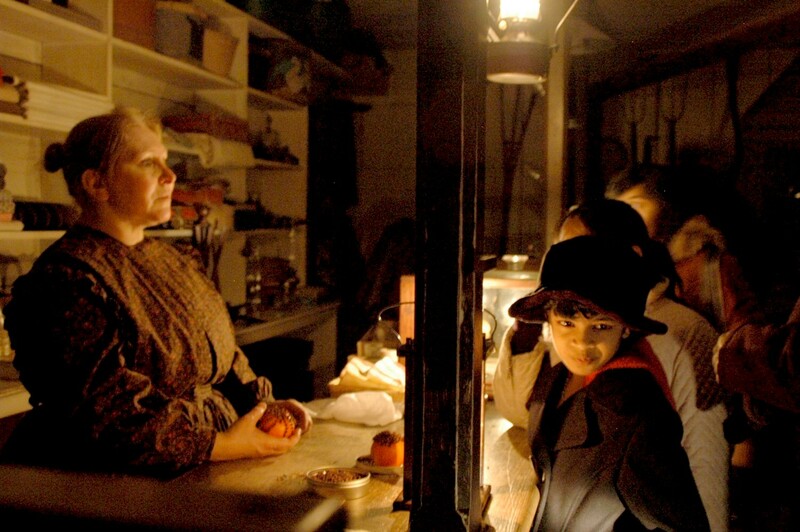 The most enchanting holiday event on Long Island are the Candlelight Evenings at Old Bethpage Village Restoration which will take place this year on December 17, 18, 19, and 20 from 5– 9:30 pm. Candlelight Evenings at OBVR offer a Hallmark card setting of flickering candles inside the Village’s historic homes, along with 19th Century holiday decorations and entertainment, all set within the confines of a rural valley setting. Among the forms of 19th Century entertainment offered will be music, including a brass quartet and fiddlers playing popular seasonal tunes as well as performers by local schools and organizations, a traditional 1866 decorated Christmas Tree, stories of Christmases past; contra-dancing, and a traditional bonfire. Old Bethpage Village Restoration, which is now operated by the Nassau County Department of Parks, Recreation and Museum, provides visitors with an exquisite opportunity to step back in time and experience life in a recreated mid-19th Century American village set on more than 200 acres. While you are there, you really forget what century it is. Entrance fees are: $10 for adults, $7 for children (5 – 12), seniors and volunteer firefighters. Children under 5 are free. Old Bethpage Village Restoration is located at 1303 Round Swamp Road in Old Bethpage (Exit 48 of the Long Island Expressway). It is closed after December 20 until April. For more information, call 516-572-8401. For more information about Nassau County Department of Parks, Recreation and Museum, call 516-572-0200, or visit the website at: http://www.nassaucountyny.gov/parks.